Continuing a trend that began months ago, sales and prices rose again in November for single-family homes in the Miami metro area. Most impressively, the median price of single-family homes rose from $178,500 in October to $184,800 in November. That’s over 3.5% in a single month, and an annualized rate of appreciation of over 42%. If this were a solid trend, buying real estate in Miami would not only be safe, but highly profitable and perhaps even an urgent matter of financial self-defense. If only the decision were that simple. There are countervailing considerations. Sales have been goosed by government benefits — especially the $8,000 tax credit that was scheduled to expire at the end of November (now extended to April 30, 2010, and you know the lobbyists will be out in force for another extension when the time comes). Many of the people who were motivated by the credit based their decision on the original November 2009 expiration. So even if prices are rising meteorically on the elixir of cheap rates, government benefits and government-sponsored mortgage liquidity, what will happen when the effects of those temporary stimuli fade? Will we ease into a new normal? Or in light of how the last cheap-money cycle ended, should we be singing Won’t Get Fooled Again? The cost of renting remains far lower than the cost of buying, so the risk of not buying remains limited to loss of opportunity to profit from a highly leveraged bet (the nature of buying anything with 10% down) on real estate in Miami or Coral Gables. The risk is not yet the diminishment of living standards. That could change if wage inflation takes hold and rents start rising fast. So far, that hasn’t happened. Median-price data reflect a shifting mix of Miami properties. The median is the point at which an equal number of homes sold for more as sold for less. If the number of luxury homes sold rises relative to the number of small homes sold, the median will rise — even if prices in the luxury segment fall. The Case-Shiller price index, which tracks repeat sales of the same properties, will be released on Tuesday, December 29, and will provide insight into whether the median is telling the true story. Don’t want to make too much of this, because the median told the story of the boom and bust and it might be foolhardy to deny it’s expression of recovery. Coral Gables and Miami are always festively decorated for Christmas. Miracle Mile is lined with lights and wooden soldiers, decorations fill store windows and office lobbies, and many of the cities’ houses are dressed in holiday cheer. 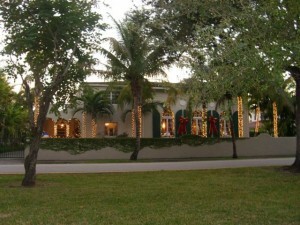 Professional decorating has become commonplace for many luxury homes in Coral Gables and Miami. 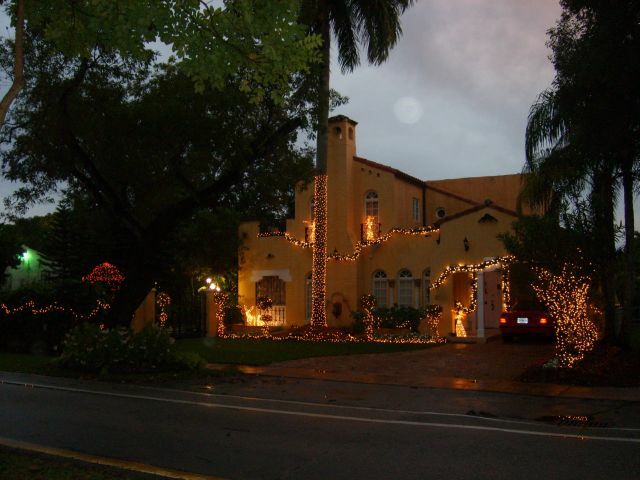 Short-Sales in Coral Gables and Miami: Deal or No Deal? Short sales are infamous for delays between contract and closing. Numerous short sales in Coral Gables and Miami have sat in pending status for many months without closing. This is usually because the seller’s lender needs to decide whether, and on what terms, to allow a sale for less than the mortgage balance. The lender and seller often need to negotiate how much of the loss the seller will continue to shoulder. A short sale is not necessarily a forgiveness of debt. The lender may insist that the seller remain responsible for all or a portion of the loss. The lender and seller may take time to negotiate what will secure that unforgiven debt once the house is no longer available as collateral — maybe the seller has other assets, or maybe the seller’s salary will be tapped for a payment plan. You might wonder whether the buyer and seller have a deal while that process plays out. Can a new buyer show up, offer more for the Coral Gables or Miami home that they wish they saw sooner, and squeeze out the first buyer? No, it’s a real deal. A typical real estate contract contains a financing contingency providing the buyer time to get a loan or cancel the deal. A short sale contract simply adds a financial contingency on the seller’s side, providing the seller time to get the lender’s approval. Unless and until that contingency fails and the contract dissolves, the deal is on. Remember, the seller in a short sale is still the owner — albeit one who is dismally underwater on their Coral Gables or Miami property. Unlike a foreclosure, where the bank already owns the property and is the seller, a short sale makes the bank’s approval a mere contingency in a contract between the buyer and overindebted seller. posted by // Comments Off on Short-Sales in Coral Gables and Miami: Deal or No Deal? If you’re buying a home in Coral Gables, Coconut Grove or the High Pines neighborhood of Miami, and you’re considering the public schools, be very careful about the information you get from real estate agents. Some are more interested in a commission than in accurate information. Some may not even know what they’re talking about. For example, almost all of Coral Gables is within a “school choice” zone that requires balloting for assignment to one of three elementary schools (Coral Gables, Carver and Sunset). The school choice zone encompasses most of Coral Gables and some of the Coconut Grove and High Pines areas of Miami. Generally, if you buy a home within the 3-school choice area of Coral Gables, Coconut Grove and Miami, you cannot know which school your children will attend until you participate in the lottery. Yet many agents tell prospective home-buyers whatever the buyers want to hear. Often, real estate agents give buyers the impression that Sunset Elementary would be the school assignment. One way this is done is to list Sunset in the “ES” (Elementary School) field of the MLS listing for a Coral Gables, Coconut Grove or High Pines property. Buyers who see the listing information on the internet (e.g., Realtor.com) or obtain a listing sheet from a real estate agent are then led to believe that their children would attend Sunset Elementary. ’tain’t necessarily so. You are not guaranteed admission to Sunset, no matter how close you live. True, you have a better chance in the lottery if you live within a school’s original (before school choice) boundaries. But it remains only a chance. Rather disgustingly, you can even find listings in north Coral Gables, far outside the original Sunset Elementary boundaries and therefore clearly unqualified for even a preference in the school-choice lottery, for which the listing agent has entered Sunset in the Elementary School field of the listing information. Sunset has become very popular because of its language program (admission to which is separate from the regular school assignment process, but that’s a whole ‘nother story) and because of its beautiful new classroom building. If you’re in the area and would like to see for yourself, the Sunset campus is at SW 72 Street and SW 52 Avenue, on the Miami side of the border between Coral Gables and Miami formed by Sunset Drive. Families with French, Spanish or German citizenship may be guaranteed entry into the language program, but as with any information about Miami schools, don’t rely on information without triple-checking. The cost of buying a home — whether in Coral Gables, Miami or elsewhere — should always be compared to the cost of renting. A recent Wall Street Journal article suggests people might finally be catching on. And don’t give me that “moral obligation to pay the mortgage” nonsense. The rooad to ruin was paved by the government and the financial community, who together enabled banks to make a quick buck originating loans and then passing the hot potato. We the People were quite happy with that arrangement as long as our “home equity” ballooned alongside the new purchasers’ enthusiastic bidding on late-stage Ponzi-scheme assets. Now that those suckers realize they’ve been had, don’t expect them to be anything but cold and calculating. Defaulting on a personal financial obligation has repurcussions. But the consequences of overindebtedness are equally real. Anecdotes here in Coral Gables and Miami suggest the stress of facing a lifetime on the hamster wheel for a depreciated asset can break up marriages and cause deadly stress. J.P. Morgan said “Sell to the sleeping point.” If somebody can’t handle their payments without risking divorce or death, I’d say cut loose. Jingle mail, jingle mail, jingle all the way. The Miami metro area has the 4th largest number of loan modifications (34,860) under the federal government’s modification program. Only the NY (43,873), LA (42,777) and Chicago (36,208) metro areas have more, and not by much. And of course, those places have 2-4 times the population of the Miami metro area. Florida Mortgage Modifications Lag Behind Rest of U.S. The yield on the 10-year Treasury note has risen from below 3.2% in early October to about 3.5% now. That may not seem significant, but it is. Why do we care? The rates on 30-year fixed mortgages are most closely associated with the yield on the 10-year note (because that’s the duration that most closely correlates with the period of time that people actually carry mortgages before moving or refinancing). Despite the rise in the 10-year yield since October, the nationwide average for 30-year fixed-rate mortgages hit a record low 4.71% a week ago. But that may not last. The spread between the two can vary, but averages 1.7%. If the spread gets compressed, something will give sooner or later. Rates have risen ten basis points (100ths of a percent) to 4.81% in the past week. Bottom line: Be aware of the yield on the 10-year note. The more it rises, the more upward pressure there will be on fixed-rate mortgages. posted by // Comments Off on Mortgage Rates on the Rise? Will Banks Approve More Short Sales in Coral Gables and Miami? Lenders . . . didn’t have procedures for employees to approve a financial loss for the company, said Alan White, assistant professor at Valparaiso University School of Law . . . . The Bloomberg report says banks are becoming more ready, willing and able to approve losses. That would be good news for buyers waiting to close on short sales here in the Miami and Coral Gables markets. Unfortunately, the Bloomberg report relies more on anecdotal evidence than hard data to show that banks might be picking up the pace. But it’s consistent with some of the anecdotal evidence here in Miami and the Gables. Maybe there’s somthing to it. posted by // Comments Off on Will Banks Approve More Short Sales in Coral Gables and Miami? Mortgage Rates at New Low. Buy Buy Miami Real Estate? Mortgage rates have hit a new low of 4.71%, according to federal mortgage agency Freddie Mac. It’s the lowest rate in the history of Freddie Mac’s datakeeping, which goes back to 1971. The next-lowest rate environment was in the earlier part of this decade, when rates hit a low of 5.23% in June 2003. Maybe other low-rate environments like the 1950s could compare. In any case, rates are remarkably low. If you’re buying a home in an area of Miami or Coral Gables where real estate prices have corrected enough to make valuations reasonable, or you’re otherwise simply getting a bargain, then it makes sense to buy. On the other hand, if you’re paying too much for a home in a neighborhood in Miami or Coral Gables where real estate prices are still too high relative to rentals, incomes and the other factors that must be considered, low rates won’t save you. It doesn’t make sense to buy a depreciating asset with borrowed money, no matter how low the interest rate is. If you intend to live in Miami or Coral Gables for a good long while, you can ride out the near-term illiquidity (i.e., inability to sell) that could accompany rising rates. On the other hand, if you might not stay in your home for a long time, buying at the current low rates could prove troublesome, even devastating. If a property in Coral Gables or Miami is affordable and attractive to you right now because rates are so low, how affordable and attractive will that property be to the buyer you will need to find in the future, if rates go up? Indeed, we just saw that happen to people who bought at those fabulous low rates from 2003 to 2006. Haven’t we learned anything? Don’t get me wrong. 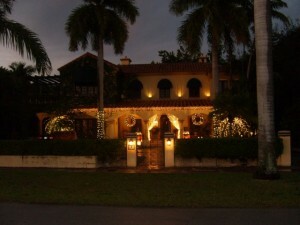 There are some great opportunities in Miami real estate these days, and maybe a few in Coral Gables too. But be sure you fit the right profile. And be flexible as market conditions change. If an inflationary scenario unfolds, wages, prices and rates can all rise simultaneously — as happened in the 1970s. Hard to see incomes rising sharply in Miami or Coral Gables right now, but if and when that happens, buying real estate will become a more urgent matter. posted by // Comments Off on Mortgage Rates at New Low. Buy Buy Miami Real Estate? Care for an example of how renting can be much cheaper than buying in the Coral Gables real estate market? One fairly typical situation (and examples abound) is for a property to be for sale at about $600,000 or for rent for about $30,000 annually. As a rule of thumb, the cost of ownership is roughly 10% of the purchase price per year ($60,000 . . . maybe $54,000 after taking tax benefits into account, depending on the buyer’s profile). The cost of buying this property is therefore about twice the cost of renting. That is a historically aberrant real estate market condition. Back in the ’80s and ’90s, when cooler heads prevailed, the cost of buying Coral Gables real estate was a bit more than the cost of renting. The price of a home typically might have been 12 to 14 times the annual cost of renting the same property, making the cost of ownership 1.2x to 1.4x the cost of renting. Now the price of a home in Coral Gables is often 20 times the cost of renting the same property, making the cost of ownership 2x the cost of renting. If something can’t last, it won’t.